This past December, I managed to pick up a pair of RAP4 T68 Post-Operation Endwar Packages. 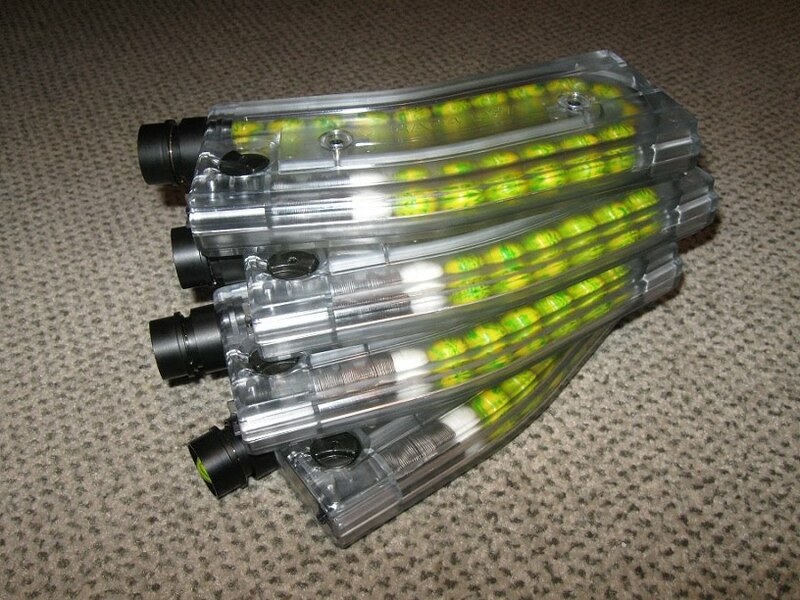 The markers, having been used at the 2010 Endwar Big Game and subsequently refurbished, were selling at a fraction of the cost of brand new 6th generation T68s. Regular readers of Grey Ops will know that I've alluded to my experience with these T68s in previous posts, such as the MILSIG 20-round magazine review. Now that I've had a chance to use this marker in several games at Action 500, I'll be doing a specific quickie review and giving my general impressions on it. 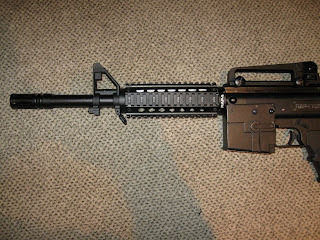 The T68 at the top features the included air-in stock, with the mods being a Dboys SIR front shroud ordered from RSOV.com, an Aimpoint Micro T-1 replica sight, a Magpul AFG angled foregrip, and a replica Daniel Defense offset quick-detach sling mount at the rear of the top rail. The second "twin" on the bottom features a RAP4 air-thru stock adapter, a Picatinny rail attachment on top of the carry handle, a replica Midwest MCTAR-17 front shroud, and a Spiderfire front post grip. Because the ASA is mounted in this way, attaching a conventional remote line or ProConnect III may look awkward, and prevent the attachment of any aftermarket stock. If you're looking to run a remote line on a T68 (which would be a necessity if you plan to run RAP4's box magazine with it), it would be a good idea to pick up the RAP4 air-thru stock shown above on Twin #2. This is now an option on the Endwar package when buying it direct from RAP4, but the air-in-stock setup is such a good value that I'd recommend getting it with the marker, then upgrading to the air-thru remote line stock later. 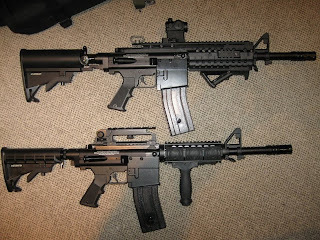 (Consider that the MILSIG MATS system retails for around $140 CDN plus the cost of a tank, and you'll understand why an included air-in-stock option for the Endwar package is such a good deal). I was quite impressed with the stock barrel that came with these T68s, and was able to get some pretty tight groupings at about 75 feet with it. If you're looking to upgrade to an aftermarket barrel (although I don't think you'd need to), any Spyder-threaded barrel will fit. In researching the T68 online before buying, on numerous discussion boards I came across the "T68s are made by MILSIG and are the same as a K-Series" fallacy. 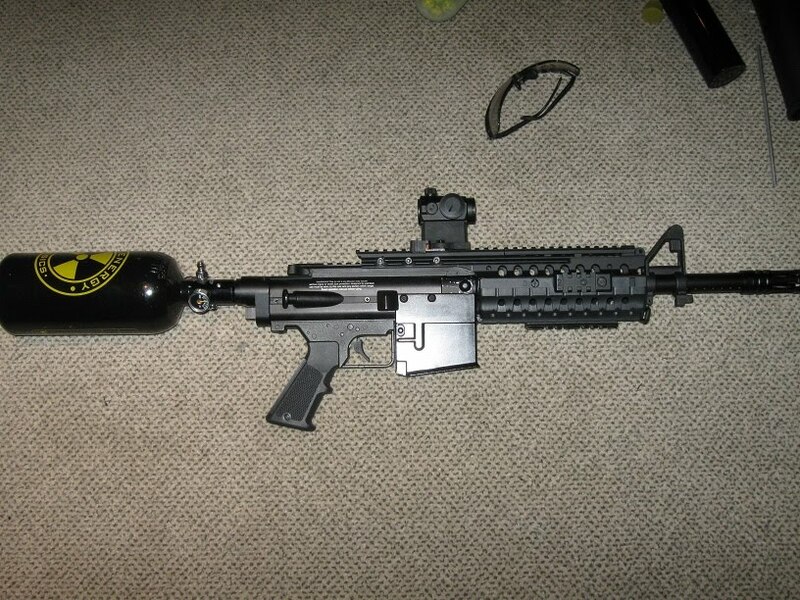 Although MILSIG/Tactmark used to manufacture the 5th generation T68s for RAP4, for the T68 Gen 6 Real Action Paintball went back to a Spyder-based design for their marker. For the record, currently neither company manufactures anything for the other, and the two companies are currently competitors that want nothing to do with each other. Any order from RAP4 totalling $150 or more before shipping qualifies for a free gift. I recommend choosing the RAP4 Basic Painting DVD as your gift with an Endwar package, because the disc includes an in-depth special feature on cleaning and troubleshooting a Gen 6 T68 marker. Another advantage to being Spyder-based is that these markers aren't finicky about lube. Cheapo Extreme Rage Marker Oil will do for lubrication, but you can buy more expensive stuff if you choose to baby your T68. My RAP4 air-thru stock worked well on the T68. 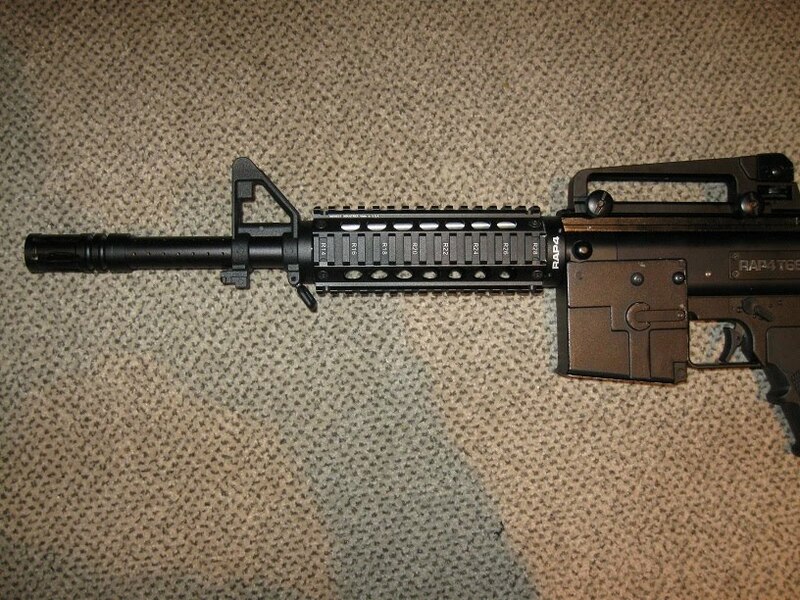 I was able to swap the included standard CAR stock with my fancy Magpul MOE stock I already owned, and most importantly it didn't leak when aired up. One small touch that makes things a lot more fun is of course the M4-style charging handle at the top of the T68 Gen 6 marker. 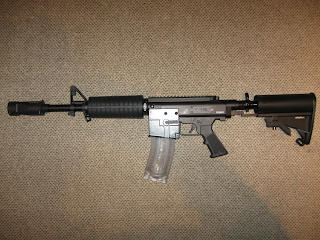 Although it doesn't pull out as far as the handle on a real steel M4 or M16, it gives a cool feel when cocking the gun. 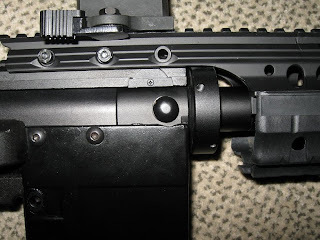 With so many Milsim Paintball players bitching and moaning all the time about side-mounted cocking handles, this feature is a really nice touch. Okay every family has issues, and with The Twins it's no different. Like that two-headed little sister that your family keeps hidden from the world and locked in the basement, there are some ugly truths about The Twins that need to be discussed. The first issue was with the included magazines. These guns shot flawlessly - when the 2 defective mags I had (out of 6) didn't screw up. 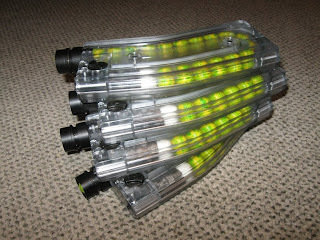 I discussed this problem in a previous post about the RAP4 clear mags, so you can read all about it there. The good news is that RAP4 was great about replacing the faulty parts in the mags, so if you're unlucky with your magazines it appears you WILL be taken care of. Bottom line: The magazines are the weak link in the process of the marker firing and cycling properly, so thoroughly inspect them before loading them and using them in a game (this applies to MILSIG mags as well, so I'm not singling out RAP4). Again, I showed you the areas to watch out for in that post. Both markers had been used for a weekend during the Endwar game, meaning that what I got out of the box wasn't brand new. So don't expect your Endwar marker to come out of the box looking flawless. There WILL be small scuffs and scratches on it - which you would've put on it playing with it for a weekend yourself anyway. The important thing is that the markers have been cleaned, refurbished, and oiled internally before shipping, so everything inside will work smoothly. More importantly, neither of these markers had any mechanical (jamming/messed up parts) or pneumatic (leaking) issues out of the box, because they'd literally gone through 2 days of testing. Any issues discovered at the game would've been repaired before these were sent out. With brand new guns that have never been fired, you takes your chances! The RAP4 site may put some people off, as its design is reminiscent of the mid-1990s. It's loaded with photos of what appear to be Navy SEALs toting real M4s, Bradley Infantry Fighting Vehicles, F-22 Raptor stealth fighters, and other symbols of US military strength. In other words, things that have nothing to do with Milsim Paintball. Buyers seeing a cheap-looking web site like this, full of stock filler images, may get the impression that RAP4 is a fly-by-night operation and avoid spending money there. The company recently unveiled a new logo, and hopefully this means a re-vamp of the web site is in the works. That's it for the RAP4 issues, which I think are tolerable considering you're getting a very lightly-used, fully-working RAP4 marker, with a 5-year warranty, at around half the price of a brand new one. For a non-RAP4 issue, I did come across a problem installing the MCTAR-17 replica shroud. 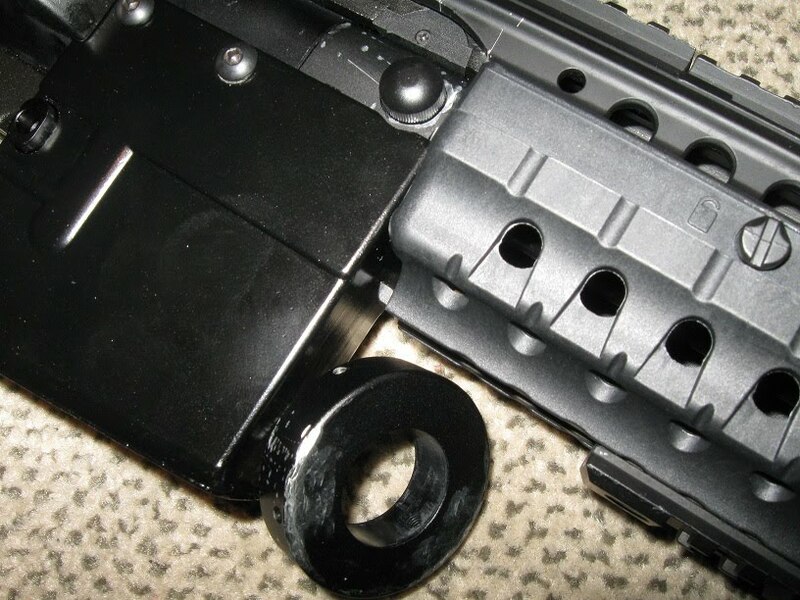 To fit into the back handguard cap/D-ring on the T68, the back end of the shroud had to be filed down to fit. Because it's made of aluminum, any Dremel tool or simple metal file does the trick. 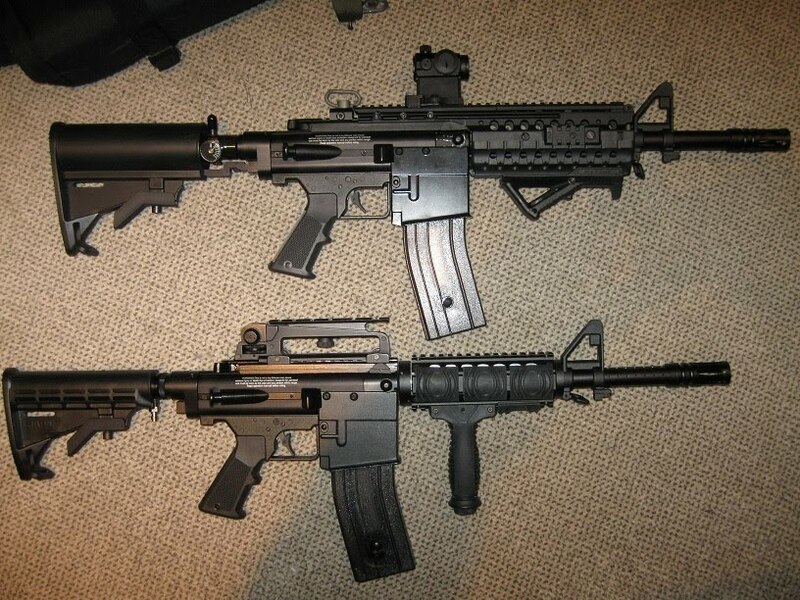 I can't blame this on RAP4 at all, because even owners of real steel MCTAR-17s have complained about needing to file them down to fit on their M4s and AR-15s. This is just something to keep in mind if you want to install an MCTAR-17 replica on your T68, for Picatinny rails on the handguard. RAP4's T68 Post Operation Endwar Package is a great value for players looking to get into the magazine-fed style of Paintball play at a lower cost. There are a few minor issues with the package, but these are forgiveable considering you're getting a truly "battle-tested", fully-working marker with a 5-year warranty, at less than half the price of a brand-new similar setup from RAP4 or other manufacturers. Post Operation Endwar packages are still available from RAP4 here at the time of this writing, and the kit can be ordered by Canadians as well without Customs hassles at the border, IF you use UPS as your shipping method. Keep in mind that if you're shopping at RAP4, the coupon code "TTPL" at checkout should get you another 10% off. Buyers Stateside can find the kits at the already-reduced price from eBay seller AC Tactical here.